As stated, I am trying to retrieve a trackable activation code, but when I click on the captcha "I am not a robot", all I get is a blank screen, no picture, no words, nothing, I click on it again and the blank window closes. Restarted browser, tried a different browser, same issue. Cleared browser history, no change. Hi BG2015 - would you mind taking a screenshot and including it below? Thank you! Thank you @AngelAppoloin. We are looking into the issue and will hopefully have a resolution soon. Until a resolution is ready using Chrome should allow you to interact with the recaptcha control in order to download your loc file. Thanks Angel, that is exactly what I was seeing. And I normally use Chrome and it was not working on 6/18, so the browser may not be the issue. I was about to create a post about this, but I see I'm not the only one having this problem. The captcha doesn't work in Firefox, Internet Explorer and Chrome. I am having the same blank ReCAPTCHA problem .... google site says version 2 has been released ... has the geocaching website upgraded to v2? 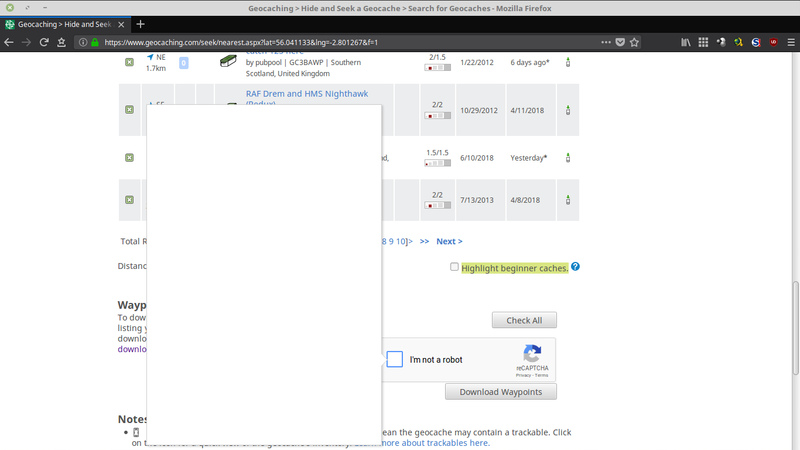 Further to this reCAPTCHA works when using the geocaching puzzle solution checker, but gives me the blank screen when using to get travel bug activation code. Quite annoying! Doesn't work for a week and we have a truckload of stuff we can't activate. Any reaction of the responsables? I can't find anything. It can't be such a problem to unarm the captcha or at least simplify it to just click on "I'm no robot". Appears to be working now, I was able to get tracking code over the weekend.